While the 2018 television season gives us plenty to watch, one refreshing series truly stands out among primetime’s current offerings. 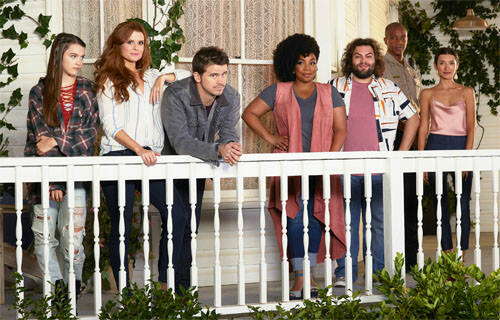 With a unique concept, phenomenal cast and consistent humor, ABC’s sweet dramedy, Kevin (Probably) Saves the World is definitely one of the more original accomplishments on TV this season.Led by the strong producing partnership of creators, Michele Fazekas and Tara Butters, Kevin (Probably) Saves the World is a deeply relatable dramedy with a ton of soulfulness, thanks to its charming lead performance from the imitable, Jason Ritter. The series finds Kevin, a down-on-his-luck man who survived a suicide attempt, an unlikely hero who moves in with his twin sister Amy (Joanna Garcia) and her teenage daughter, Reese (Chloe East). After he discovers a celestial being by the name of Yvette (Kimberly Hébert Gregory), who claims God has tasked Kevin with saving the world, she is advised to guide and protect him as he sets out on a mission to find the 36 righteous souls around the world. Unfortunately, Kevin is the only one who can see Yvette, which makes for some crazy shenanigans and situations. Great ensembles not only create an unspoken bond between a show and its viewers, but a welcomed chemistry shared on screen brings about a great level of comfort — one that feels like home. Kevin (Probably) Saves the World does just that with its talented and adorable cast, and the chemistry between each one of them is pure joy. Ritter’s range of acting has been seen for more than a decade now with series like, Parenthood to Another Period, but his performance in the ABC series is one never seen before. From a man who has hit rock bottom, to someone having faith in the unknown throughout the season, Ritter has shown who Kevin is and the potential to who he will become. With an endearing performance that is animated one minute, heartfelt the next and treading very serious dramatic hues, it’s fun to see his range broaden with a role like this. With Kevin steadfast on his mission, he is also supported by a phenomenal cast. Playing his sister, Garcia Swisher is a delight as the perky, concerned twin. She and Ritter might not be family in real life, but their chemistry on-screen is an honest one, full of love, that also plays to a combative brother-sister relationship. Ritter’s dynamic with East, who plays his niece Reese, is playful and almost fitting of a father figure. One of the biggest relationships on the series though is that of Kevin’s “messenger from God,” played by Gregory and it’s a very tender one. The two stars not only have an interesting connection with their on-screen characters, but it’s a rapport that brings out the emotional depth of both characters, especially as time goes on and they bond. Not to mention, theirs is one that springs some very hilarious hijinks since no one else can see her. The supporting cast, including the likes of J. August Richards as Dep. Nate Purcell, India de Beaufort as Kristin, and Dustin Ybarra as Kevin’s best friend, Tyler Medina, who has a pure heart of gold, are just as amazing and lovable, bringing their likability to every scene for a warm watch. Playing off Ritter’s direction, they are perfect in every way, and truly bring something charming to every scene. The heavily saturated television landscape today full of genre-specific series has posed an enormous challenge for viewers to cut through the clutter of finding a compelling, original series. While many might argue TV has reached its peak, Kevin (Probably) Saves the World is one of those series really driven by its fresh writing and original concept. Albeit the supernatural-angelic angle, the ABC series is about real people and their relatable problems, rather than the procedural assembly line plot coated with doctors, lawyers and cops. Inspired by feelings of hopelessness, Fazekas and Butters tell Entertainment Weekly that the concept for the series came about shortly after the presidential election in 2016, with the realization that things don’t have to be bad. There are ways to make life better for not just ourselves, but for those around us. That awareness is eloquently formulated into every episode through quick-witted writing, poignant philosophy, realistic situations, and the opportunity to really connect with one’s own thoughts and feelings. As someone who doesn’t want to even be a hero or consider himself one, Kevin’s dialogue alone is speckled with biting humor that cuts through the therapy-type sentiment (“I think everything is beautiful, and I don’t like it.”). Kevin, and all the characters on the show, are not perfect people with perfect lives. They’re adults, parents, kids, making mistakes and trying their hardest to figure it out, while understanding that kindness matters along the way because everyone is fighting their own battle. While that’s something all of us can strive for in 2018, one of the best messages behind the series is how random acts of kindness and true selflessness contribute to the bigger picture in life. While expressing kindness is something learned from childhood and “The Golden Rule,” the show tackles the concept in a realistic way. Truth be told, we might all be kind, but we’re also selfish and these characters, including Kevin are too. But when Kevin receives signs that lead him to those in need, he pours his heart out to help others, seeing how it has a ripple effect on them, making for a greater human experience. Not to mention, his selfish attitude dissipates more and more every time he finds clues to a righteous individual after helping a random person in need. In the episode, “Rocky Road,” Kevin literally gives the clothes off his back to an unemployed man, ending up walking around town in just his boxers. But the good that comes from such a gesture reminds us how little acts do add up in life to something greater, especially when we push our ego aside. Kindness and altruism, as evidenced on the series, is contagious and the more Kevin acts upon those signs to help others, the more he notices they too become inspired to act that way themselves. Faith, at its core and as seen on the series, is deeply rooted in the expectation of good things to come — something that goes beyond hope. Moreover, it’s not something reserved for religion. As Kevin discovers, having faith is the ability to have trust and confidence, in people, ourselves, and in that which we cannot explain. Moreover, it’s the guiding light that helps push us towards our purpose and Kevin is getting there, one episode at a time. Are you watching Kevin (Probably) Saves the World? What do you love most about the show? Share with us in the comments below. Kevin (Probably) Saves the World airs every Tuesday at 10 p.m. EST on ABC, check your local listings. Three compelling reasons to watch.